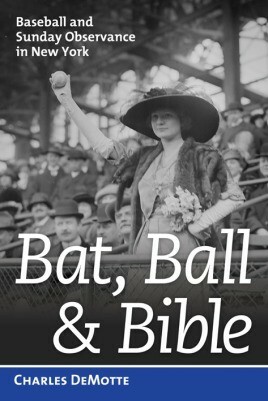 Bat, Ball, and Bible chronicles the collision of moral and social forces in the argument over playing baseball on Sunday or upholding New York's blue laws, meant to restrict social activities and maintain Sunday's traditional standing as a day of religious observation. Unfortunately, due to sales rights restrictions, we cannot offer Bat, Ball, & Bible for sale in your country. Bat, Ball, and Bible chronicles the collision of moral and social forces in the argument over playing baseball on Sunday or upholding New York’s blue laws, meant to restrict social activities and maintain Sunday’s traditional standing as a day of religious observation. Baseball was at the center of this conflict, which led to social and moral upheaval at a time when New York was already undergoing rapid changes. Bat, Ball, and Bible is not solely about baseball; rather it illuminates one of the earliest instances of a “culture war” whose effects are still being felt today.